I've always been a big Marshall McLuhan fan. 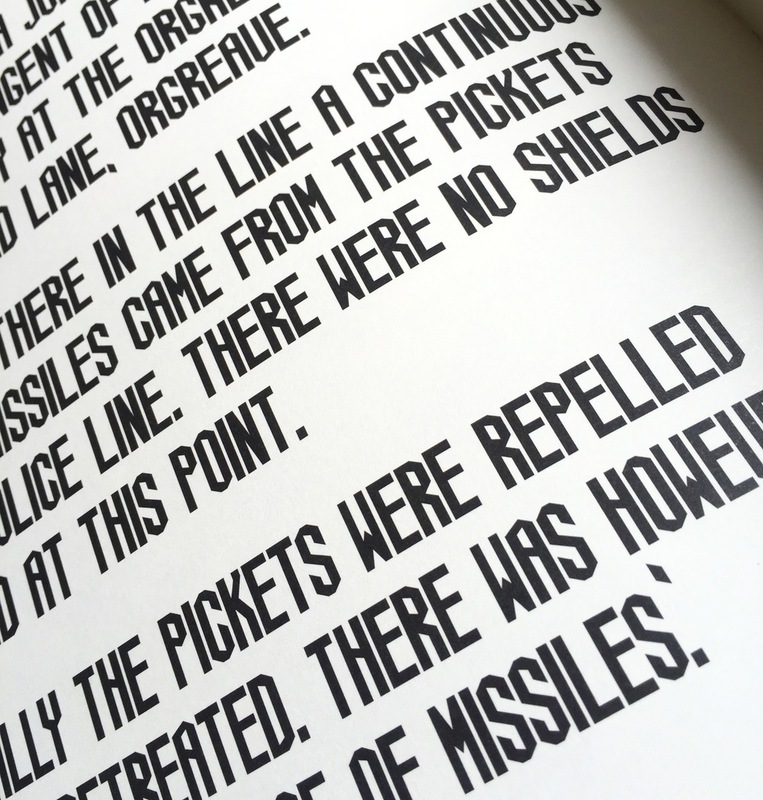 As a young graphic design student the books created in collaboration with Quentin Fiore changed my outlook on what a 'serious book' could look like. They helped me understand that the designer is never neutral or passive to the content. 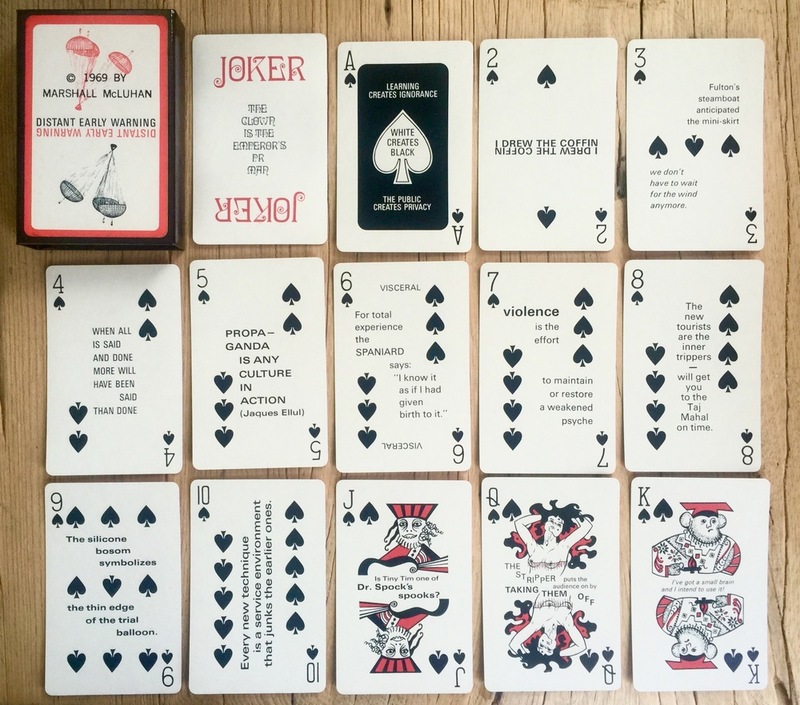 So when I found out about this deck of cards "Distant Early Warning" via @openculture I had to see if I could get hold of a set. Well it was much easier than I'd have expected and also rather fantastic. 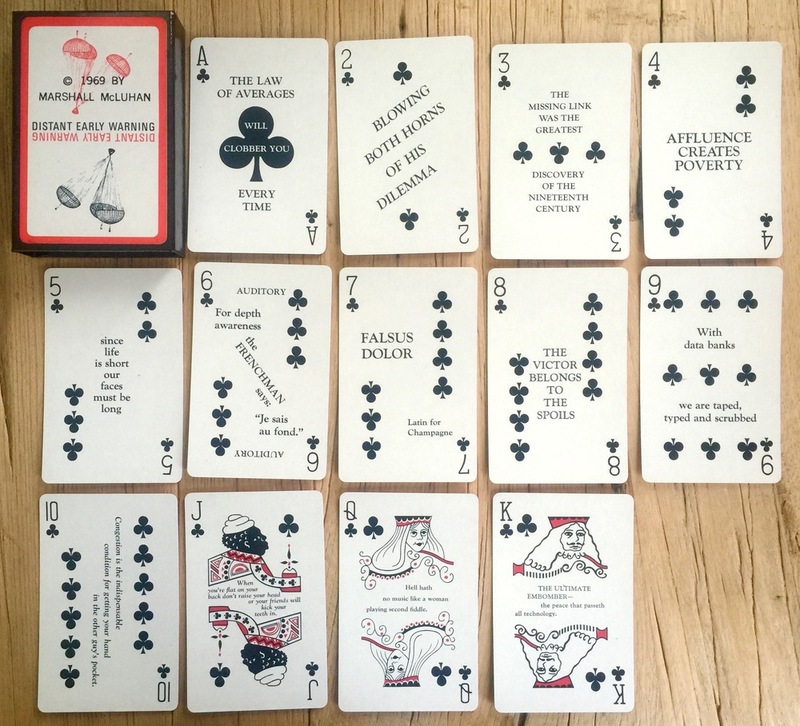 You can get them from Eric McLuhan's website (Marshall's son) http://ericmcluhan.com/ not only that but you need to email him to get them. So I ended up dealing with Andrew McLuhan (Marshall's grandson), talk about a family business. This gave the whole experience a wonderfully personal touch. 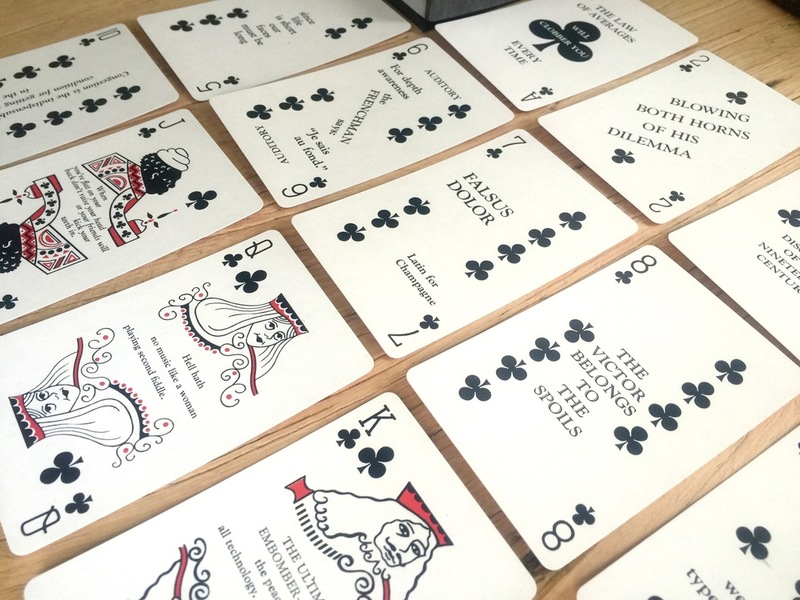 The cards are fantastic and are real playing cards rather than simply prompt cards. 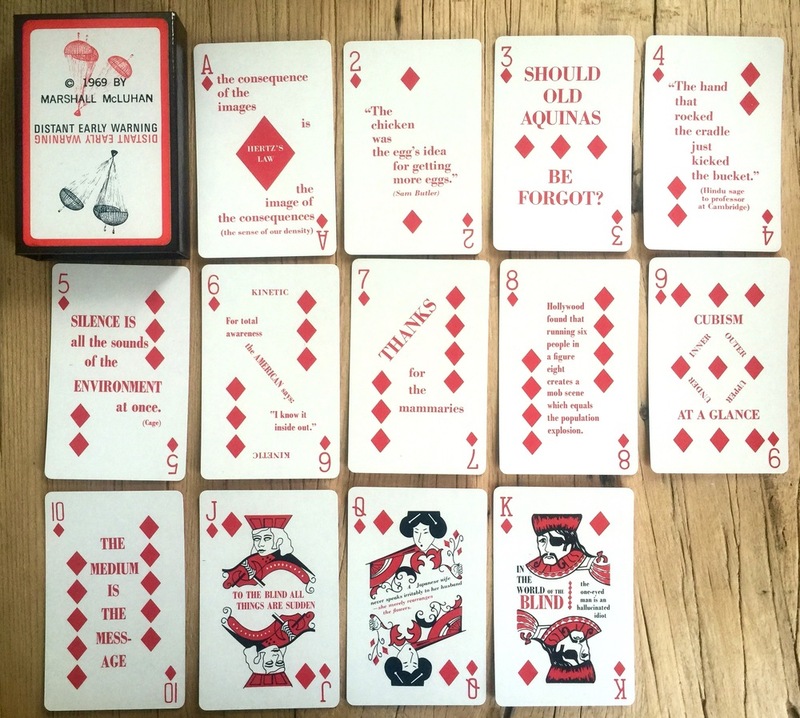 I think this might be one of the first examples of playing cards as a non military political/social tool. 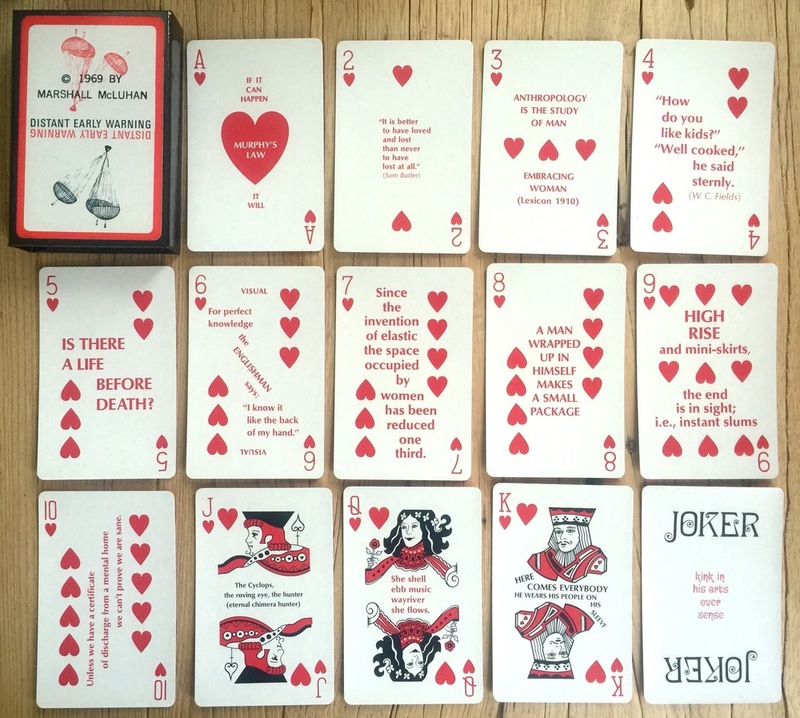 Military propaganda units have used playing cards since before WWII as a means to both identify and lampoon their enemies. 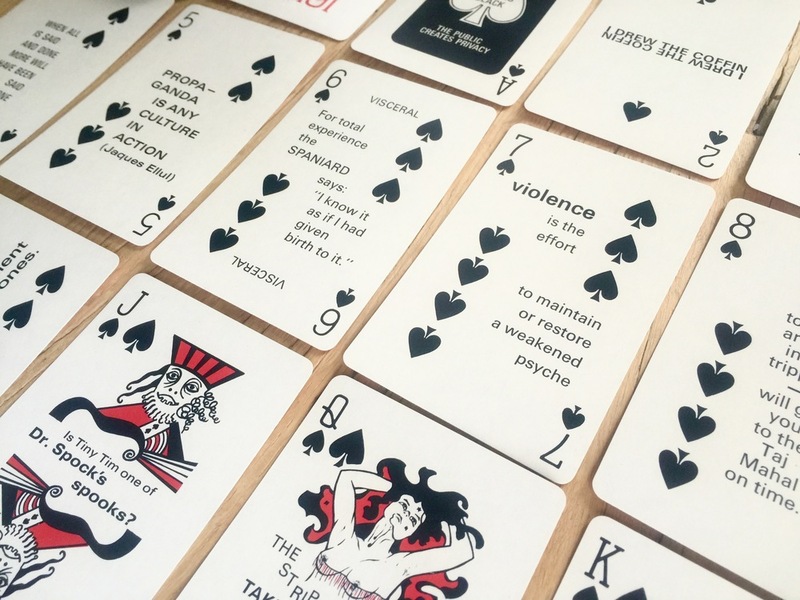 Considering the publishing date of 1969, (when anti Vietnam War sentiment was high) I couldn't help but be reminded of the anti Gulf War cards released to counter the real Gulf War 'Most Wanted' Cards - Alternative Regime Change. 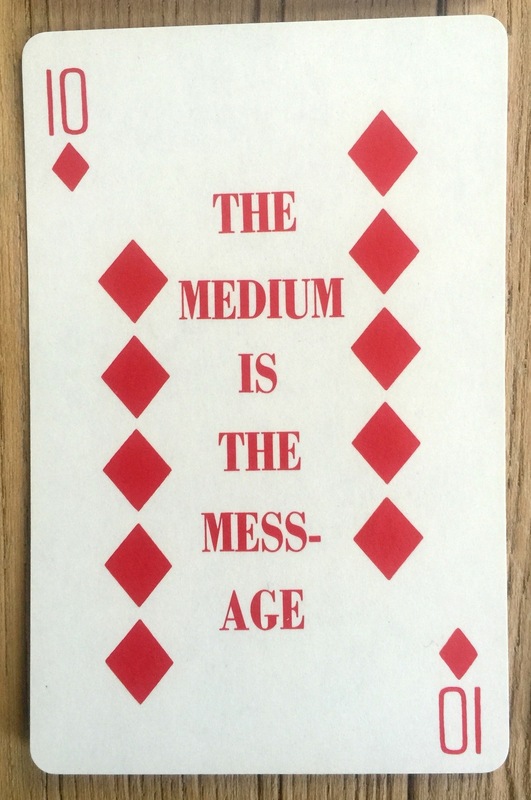 Although there's no overtly antiwar messaging in McLuhan's deck. 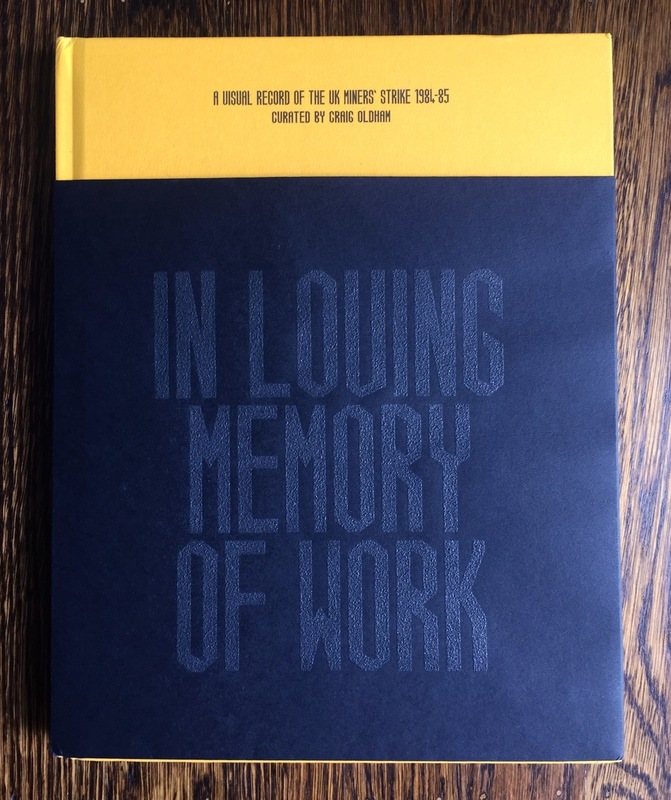 Just received my copy of the spectacular In Loving Memory of Work: A visual record of the UK miners' strike 1984-85 curated by Craig Oldham. It's a wonderfully designed by Craig Oldham and Aaron Skipper, and published by A Unified Theory of Everything. The wrap around cover is extra special as it's made with coal dust and the design throughout is exceptional. The bold typography and strong use of colour reflects the 'agitprop' and political topic perfectly. On top of that the use of stickers on the board cover is a great touch. 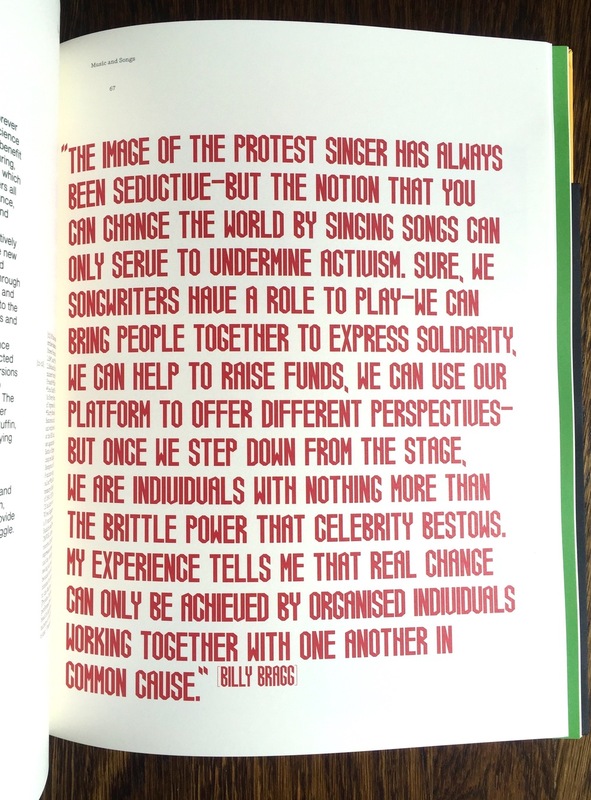 As with many grass roots and community lead acts of resistance, design and production was on the cheap, often hand made. 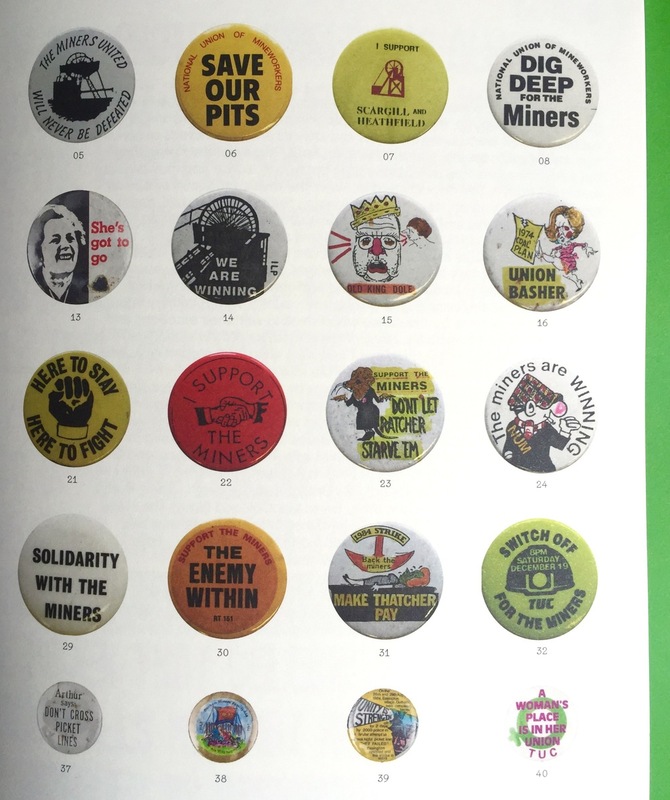 The primary point being that it could be easily disseminated, thus photocopies, fly posters, stickers and buttons are at the heart of the visual language. The book treats it's subject with sensitivity. It's not just a visual history, it engages with the people and events. It's humane design. There's also this great film showing the production accompanied by a poem by Pete Currie. I held on to this issue of I-D magazine from January 1995 mainly because it featured people I knew back then, but also because my vanity got the better of me (you can see a poster I designed in the background of one of the photographs). I hadn't seen it for years and was struck by the fact it's 20 years old this month, so thought it deserved seeing the light of day once more. What's interesting is that it's the 'future' issue and all about 'cyberspace' and tech. 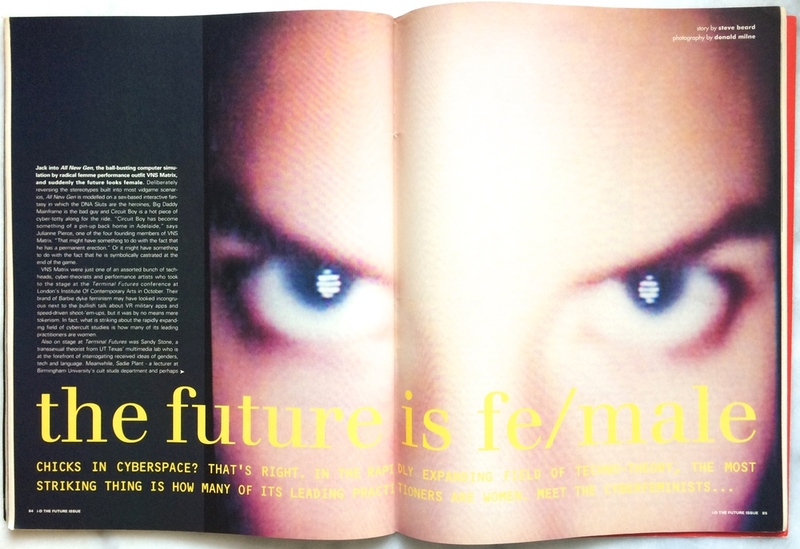 I've have a sneaky feeling that even when this was fresh off the presses, 'cyberspace' was already a clichéd term. However there are a couple of good pieces as the angle is nice and dark, featuring Scanner (@robinrimbaud) and the Underground crew (Matt and Graham). 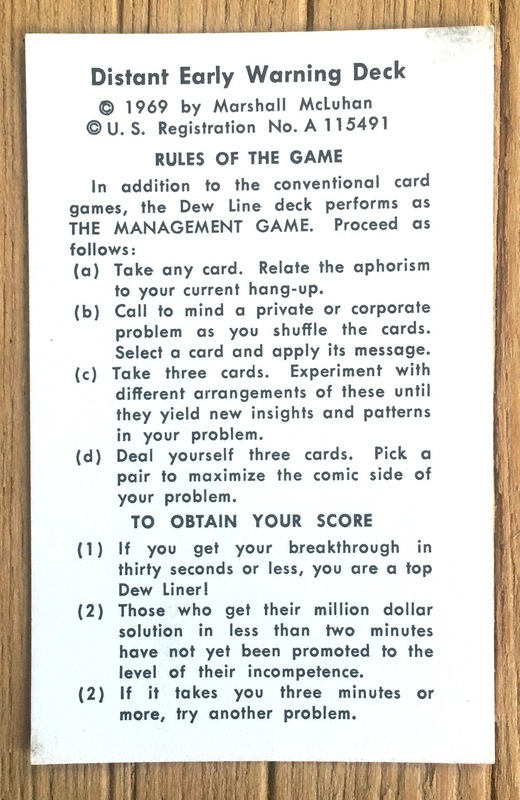 Fairly prescient stuff: "The threat exists that our communication will be exploited in ways we cannot yet imagine"
The tech gadgets and ads are funny as so of the time, pagers are a big thing and that Bicardi ad is a stereogram! I've posted previously about how there was an idea in the early '90s of DIY culture. 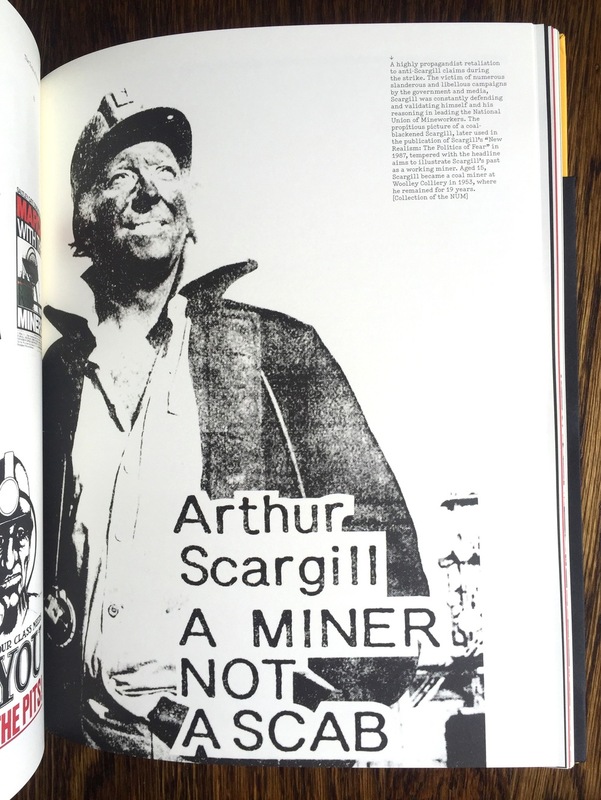 This manifested in many ways from 'crusty squatters' and indi-networks through to self publishing and a revival of the punk aesthetic and the 'zine. This post is about the later. Head Magazine was published by a small group of loosely associated people. Each issue was driven by one of them and whoever they could persuade to help them to produce it. This meant it had no strict identity as a magazine, with each issue being a unique artefact published at random intervals. Often contributors would appear across many issues but the subjects would be diverse, as each issue had a 'theme' associated with it. The issue shown above is No. 6 The Ambient Fishy Issue. The main themes were ambient music, noise, technology, conspiracy and paranoia. All sprinkled with a generous helping of mildly left wing politics and some tongue-in-cheek humour. 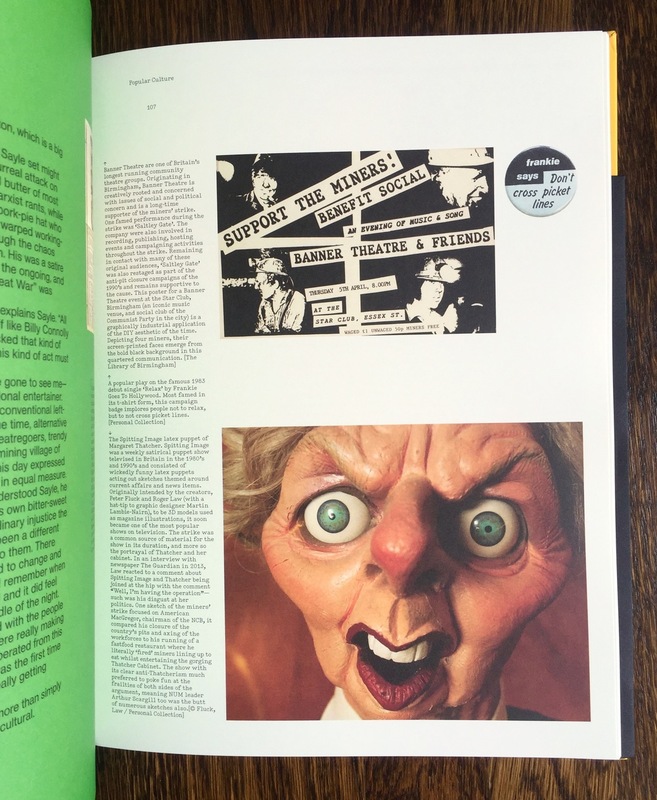 The magazine operated a very 'open' editorial policy, pretty much everything that was sent in made it to the issue, as long as it aligned with the theme. Content standard varies a lot but that was very much part of the ethos - sod the established ideas on what 'quality' is and let everyone have a go. As you may have guessed there was more than the odd ageing punk involved. This is one of the key differences from the indi and self publishing scene of today. Today quality matters - a lot. Today small independent magazines are surviving and thriving thanks to that focus on quality, both in terms of content and production. Access to cheaper and better production technology has certainly helped this. I wish that the very excellent http://www.newspaperclub.com/ had been around back then. Colour printing was a costly business so single colour was the norm with most of the artwork created in bedrooms then photocopied. This issue was a little different as it was put together on a PC (4mb of RAM) using Photoshop and QuarkExpress, and thanks to a few paid Ads it was printed and bound. The two creators; Mobile D-Unit and Faceless Networker laboured long and hard to get the chaotic, layered, dense and noisy layouts that feature throughout the mag. The imagery for each page was created as single page TIF files in Photoshop 2.5 (the days before layers and 99 levels of undo) using 'magic wand selections' and 'paste inside'. The images were shared back and forth, mainly by personal delivery of a 'zip disk', with each person adding their own touches, tweaks and layers. The main body copy was laid out over the top and fitted appropriately, if the fit wasn't right the image was changed. This took a lot of patience, effort and was prone to mistakes. The issue is full of patterns, codes, repeat gags and deliberately bad type. The content is a continuous stream of visual noise flowing from spread to spread. You have to work hard to stay on track when reading an article as the design and the other content is always attempting to disrupt the flow. This is especially apparent when you discover an interesting nugget hidden away in the noise, finding your way back is not easy. It's in no way a great piece of print design rather a signature of a time, place and attitude. It featured along with many other similar pieces in the Barbican's Jam: Style+Music+Media exhibition circa: 1996. 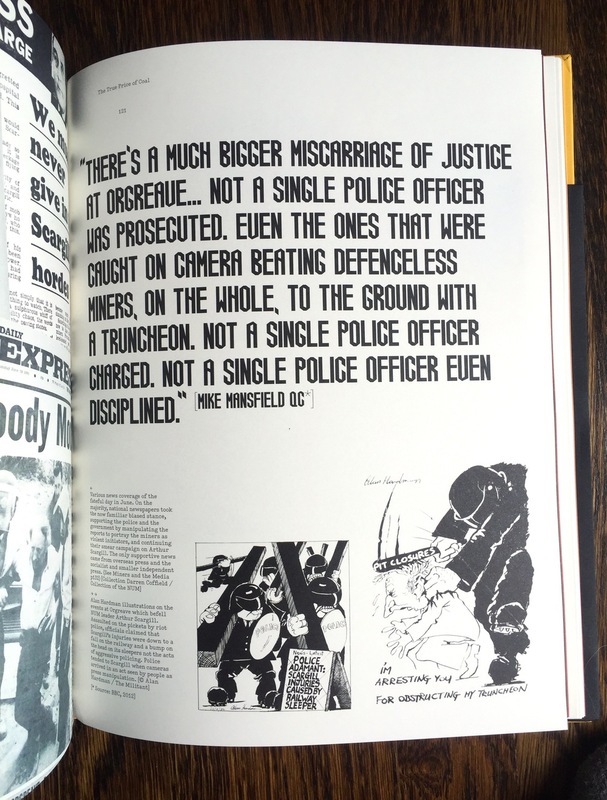 This type of mag is long gone and has been replaced by a lively and growing community of self publishers and indi press. They are using digital and web based publishing technologies to create wonderfully rich and engaging pieces, often by blending them with hand printing and traditional print techniques. It's a great time to create a magazine. Yet still they scream "print is dead" as they did back in the '90s and every 10 years since. Must be on at least it's 4th resurrection by now - difficult to kill off something thats been we us 550 years. Underground - "A free broadsheet for London"
Underground was an alternative free paper for London. It was compiled and published in the early 1990's by Graham Harwood and Matthew Fuller amongst huge group of contributors and helpers. It spans the death of Thatcher's legacy (John Major) through to the early Blair years, in six issues. To say this project was 'left of centre' is both an understatement and a disservice to the project as it challenged most of it's readers and anyone who picked up one of the freely distributed copies. Above shows the six covers all featuring the photoshop talents of Graham and a small selection from inside. The first issue was a full broadsheet and the shear scale of that image still makes me wince and smirk. However issue six and Tony Blair still causes raised eyebrows and ruffles plenty of feathers. Funny how hindsight works.